My Pillow – ConsumerAffairs Put My Pillow to the Test. You may have seen My Pillow’s inventor Michael J. Lindell a Minnesota-born former cocaine addict and inventor in the My Pillow infomercial. whose chopped-foam-stuffed pillows, which sell for about $50, brought in more than $100 million in sales in 2012, according to The Star Tribune of Minneapolis. In the 30-minute advertisement, Lindell goes on and on about how his pillows are “the best in the world,” and how the pillow is perfect for every type of sleeping pattern. “It will change your life,” he says. The best in the world? Change your life? product claims don’t get bigger than that, do they? ConsumerAffairs decided to put My Pillow to the test, to see if it’s really the best pillow on the market, and if it truly lives up to all of the claims on the infomercial. Click Here See ConsumerAffairs Article by Daryl Nelson, My Pillow: Does It Really Do That? 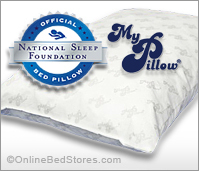 MyPillow® Classic Pillows fully are machine washable. Sizes: Standard/Queen 28” x 18.5” or King size 34” x 18.5”. OBS recommends that you do your research before buying any pillow online, call the online retailer to ask questions to see if that particular pillow is right for you. If you feel your questions are not getting answered intelligently based on their experience with the pillow you are interested in, just move on. Keep in mind a pillow that feels great to one person may not be right for another, to be fair tell the retailer what kind of sleeper you are, back sleeper, side sleeper or stomach sleeper. Classic Standard/Queen, My Pillow is Machine Washable and Dryable, Medium or Firm.